This page includes a link to a Dissertation on York's walls by Nana Zheng. It is big file that takes some time to load. I conducted a telephone interview with Mr. David Bruce, a visiting research fellow (former principal lecturer) in Tourism at UWE, Bristol. His major research interest is in Cultural and Heritage Tourism for historic towns and Tourism Transport. As academic adviser to the European WalledTowns (EWT, the former Walled Towns Friendship Circle), he is particularly enthusiastic about walled heritage. 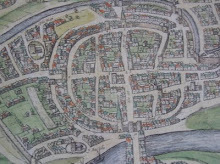 He is also an active blogger and his blog(http://www.walledtownsresearch.org) is rich in both tourism and academic information on walled towns and cities principally in Europe. I read David's article on walled towns and therefore thought that his background was of cultural heritage or archaeology related. But actually his specialism turned out to be tourism. When asked why he's interested in cultural heritage tourism, he said that it is largely due to his academic background and working experience. Originally, David did a degree in History and in Economics and then in Town Planning. Before he started to lecture in Tourism, he worked in the public transport sector. Being a lecturer in Tourism for twenty-five, "I found that I could research in walled towns for tourism in historic towns and cultural tourism. So that's how I got involved." He said. Compared with other types of tourist attractions, city walls have certain special qualities, according to David. "They are basically very impressive and they are often the first thing that a visitor sees.. The city gate, or the city wall is the first impression." While city walls are remarkable, they have nevertheless been deemed "cumbersome" in terms of traffic and therefore were often changed or even demolished. But David argues it as "one of the greatest advantages of the walls", since they "set a clear limit where pedestrians and people shopping and using the town should have priority over motorised traffic." So the priority within the walls, should be pedestrians and people using the town or even riding a bicycle, rather than motorised traffic. Shortly after the establishment of Walled Towns Friendship Circle in 1990 (now known as EWT), David became involved in it. Then he was doing some research work in Chepstow, South Wales and his student research assistant needed to find a dissertation topic; he discovered this newly established network and David suggested that he create a database of the members of the new network, which was later proved useful. "And so I could be useful to the network and also I found people in the network are very friendly and very interesting to work with." He added. As academic adviser in EWT, David also acts as their corporate memory. "I know how their constitution works and how it can be changed when they want to change it." Also, he tries to get people to look outside the walls. "Because every walled town, I'm sure you've found this with York [where Nana Zheng studies], believes the world revolves around its own walled city. Every walled city is the centre of its own world." Now David is putting together the work he's been doing into a book which is to be published in next couple of years. "Probably it'll be called something like 'The City, Walled' and it will look at the issues of outside influence on walled cities and their influence on the outside world"
However, he has had some difficulties. One President tended to favour, not unreasonably but in the end excessively, his own town, so certain tensions and difficulties built up and an election was held. When it comes to elections, EWT has tended to lose some members "because they were disappointed that their candidates haven't won". "But it's very necessary to move the leadership from one town to another." In terms of promoting city walls, there are some difficulties that don't exist in many other types of tourist attractions. City walls often survive where one heritage is in conflict with another. Take the city of Derry, or Londonderry for example, "it has two names - that expresses the problem. Because Londonderry is the name given by the English Protestant settlers and Derry is the name given by the original Catholic Irish population." Their conflict has led to poignant armed civil conflict as recently as twenty years ago. Similar situations exist in different parts of Europe, such as some Basque walled towns in Spain and in former Yugoslav countries. They all bring out the questions of the dissonant heritage. EWT is rare in that the cooperation is dedicated solely to walled towns. To enhance such cooperation, it builds on two declarations. 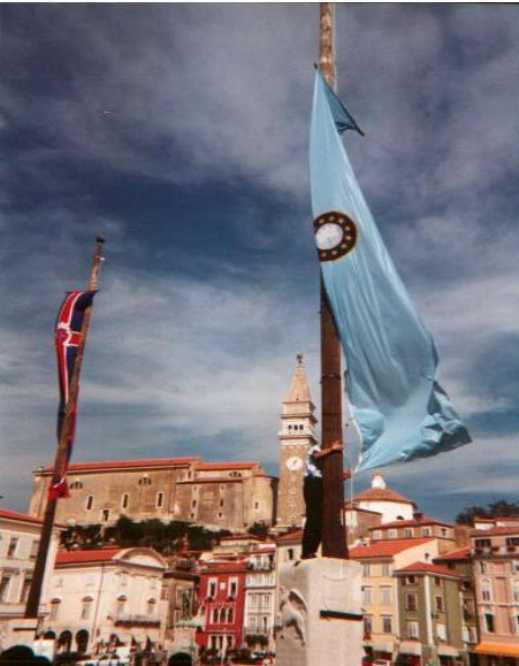 The Piran Declaration emphasizes Conservation and the walls as a symbol of time. The Canterbury Accord is about reconciliation of conflict attached to the walls and creating sanctuaries "The walls can be used as a symbol to address the issues behind different conflicts" and may be used to shed some light on such conflicts and their resolution at the Derry conference of next year. Does EWT really help in bringing different countries together and solve their individual problems? David said, although "it hasn't necessarily been as successful as it might have been...but the fact that it has survived till now for 22 or 23 years, despite the changes in Europe and beyond, suggests that it can continue its work." EWT is successful in that "it does bring together towns from different parts of Europe, particularly the outlying parts of the Europe - Eastern Europe, the Mediterranean, and even the far northwest of Ireland." But its influence is much less satisfactory in the middle of Europe, such as in France and Germany. David reckons it as "a problem with many European networks", which fail in getting local people in big European states to "take an interest". According to David, in the very beginning the Walled Town Friendship Circle was very keen on seeking wider cooperation among other walled towns in outside Europe: Xi'an, China sent representatives to two symposia in Europe. He is also interested in attracting cities like Hue (Vietnam), a number of Japanese, Indian and the Islamic walled cities of North Africa. EWT has been and is still developing links to cities in Turkey, where the 2009 Symposium was held (Ozmangazi-Bursa). This act may be seen as the first step towards its effort seeking broader cooperation beyond Europe but that remains to be seen. Getting beyond funding is a big issue for many heritage workers. One of the objectives of EWT is to "acquire European and other funds". So they have done a lot of application writing which helped them get extra partners, said David. They had a very successful application a few years ago, an ARCHWAY Interreg 3C Project (2004-2008) and "Last year, however we put a lot of time into URBACT application for town conservation in Europe but without success." Apart from being involved in EWT, David was also a leader of the EC-funded marine ecotourism in the Atlantic area project. According to him, the work he did in that project complemented his work in EWT. Both have involved analysing less unsustainable transport for tourism and working with communities. And both needed acceptance of the differences in approach of different groups of researchers from different countries. City walls and walled cities are priceless. The walls provide a boundary for a living space. But this boundary does not necessarily confine the life within the walls. Instead, as David put it, the walls have far-reaching impact on the space outside a city. Nowadays, activities related to city walls have reached far beyond the city itself. Promoting and managing them is sometimes very difficult. It calls for coordination among different sectors, such as transport, city planning and cultural heritage. In this sense, David's versatile background benefits his work to a great degree. Besides inter-discipline cooperation, support from an international network is all the more needed. "Shortly after the completion of this interview report, I heard some more comments on EWT. How I wish I could knew this earlier, so that I could come up with more useful questions for this interview. It always puzzles me that York, as one of the excellent survivals of walled towns, has not joined EWT yet. After I sent this report to Friends of York Walls, I heard that, some official members thought EWT was kinda like a "drinking and social club". Whether fair or not, this radical comment demonstrates the potential difficulties confronted by similar organisations/forums like EWT to some extent. As David mentioned, many similar organisation failed in obtaining support from big countries in Europe - perhaps some of them are holding similar attitudes towards these organisations. However, it can be seen that, this kind of international cooperation does benefit member states, Their successful funding application demonstrates the advantage of such cooperation. Indeed, loose organisations among governments are always faced with all sorts of efficiency problems, mechanism problems etc. I once joked that I would like to set up a similar organisation in China and look forward to cooperating with EWT, but now, I am more inclined to wait and see whether this will be the effective way for walled towns in the future. This conclusion might be controversial[added Nana] But I guess you [David] may have already heard of similar comments before. At least it is not rare for me [Nana] to hear of comment like this on other organisations.